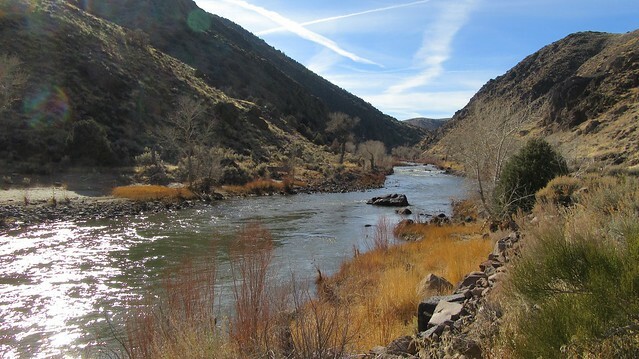 There have been some changes in the Carson River Canyon in recent years. 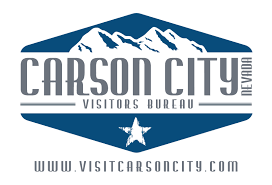 Since Carson City Open Space took ownership, new rules are in place for the safety and enjoyment of all visitors. Regulations now include no shooting (with exception to hunting with shotguns during waterfowl season), no camping, no fires, no dumping, and no vandalism or graffiti. There’s also an automatic gate at the canyon entrance that closes at dusk and reopens at dawn. I’ve already been down to the canyon for a few rides this winter, and the changes have really made a difference for the better. 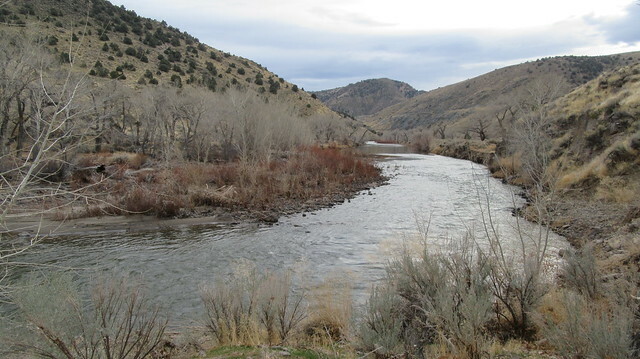 Carson River Canyon runs from the bridge on Deer Run Road all the way to Dayton. 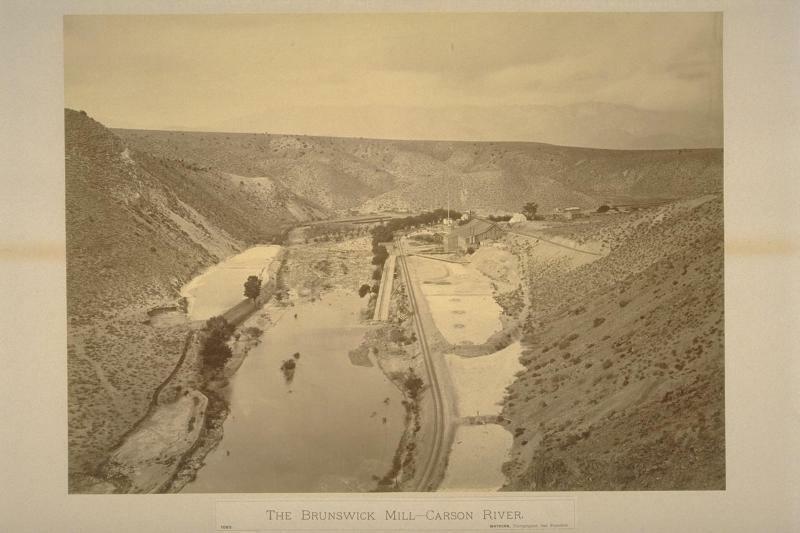 Some people confuse Carson River Canyon with Brunswick Canyon. 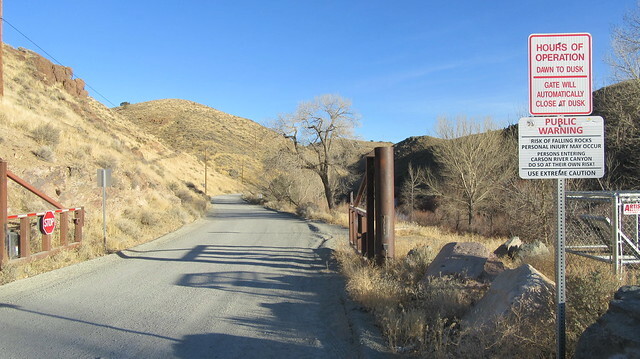 Part of this confusion is due to the road leading into Carson River Canyon being named “Brunswick Canyon Road”. Up until the flood of 1997 when the bridge near the pit mine washed out, this was the usual way to get to Brunswick Canyon on the south side of the river. You can no longer get to Brunswick Canyon via Brunswick Canyon Road, though, and must go over the hill at Sedge Road further south. Still, the road name remains. 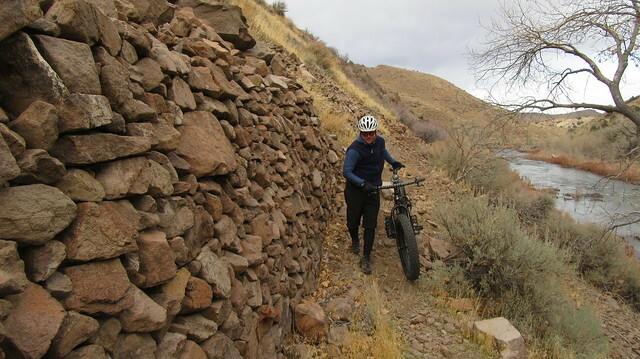 One of the things I’ve enjoyed most about riding the Carson River Canyon is learning about its history. 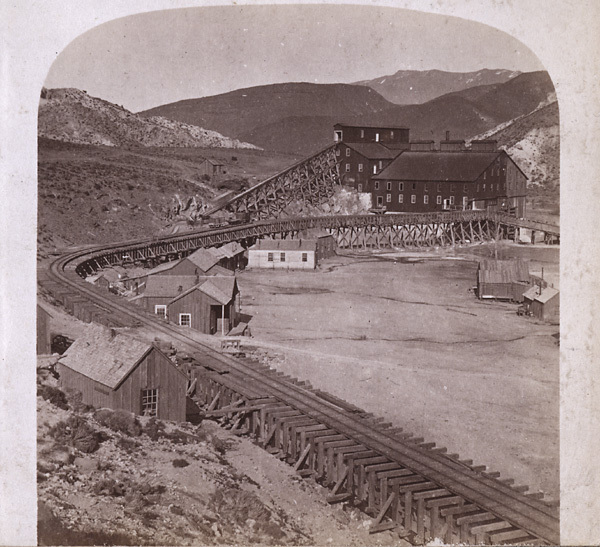 In the 1860s, several mills opened up along the river to process ore from the Comstock Lode in the Virginia City area. Ore was originally delivered to the mills via horse and cart, and then later by the V&T Railroad. Using a series of dams, ditches, and flumes, river water was diverted to the mills to power the stamps (crushers) and for use in the gold and silver separation process. Some of the mills operated into the early 1900s, but all started to disappear at the beginning of the 20th Century. Metal was scrapped, and wood was removed and used as kindling. Some mills burned down. Even back then, they still had problems with seasons of drought and flooding. Dams and Mills were sometimes taken out by high Spring runoff. There is still much evidence of the mills along the river, but it’s easy to miss unless you know what you’re looking for. 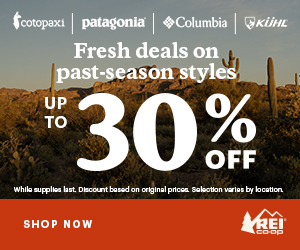 Mexican Dam to the south, the Yerington Smelter site in the river canyon, and the Rock Point Mill site in Dayton are the most recognizable remnants. Other mill artifacts are less visible. Several photos of the historical mills can be viewed by clicking here. 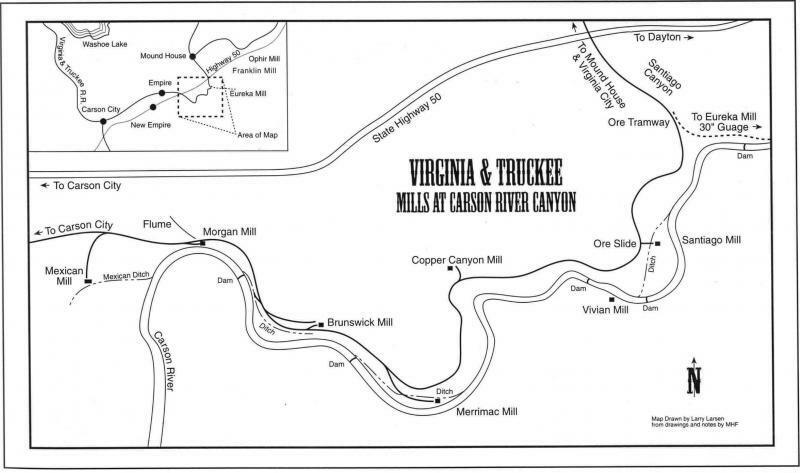 As most people know, the old V&T Railroad once traveled through the Carson River Canyon between Virginia City and Carson City. The dirt road that is there today is where the tracks were. 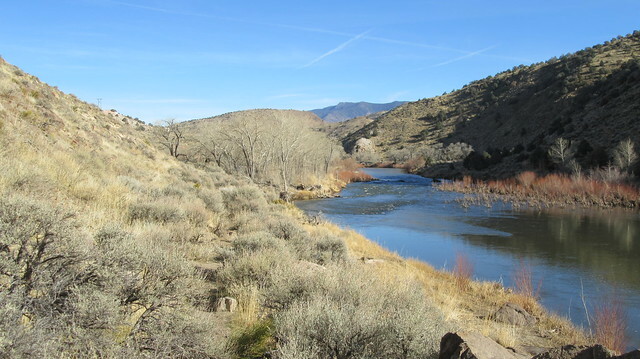 In recent years, the tracks have been restored into the Carson River Canyon from the Virginia City side, and end near Mound House and Lyon County border. 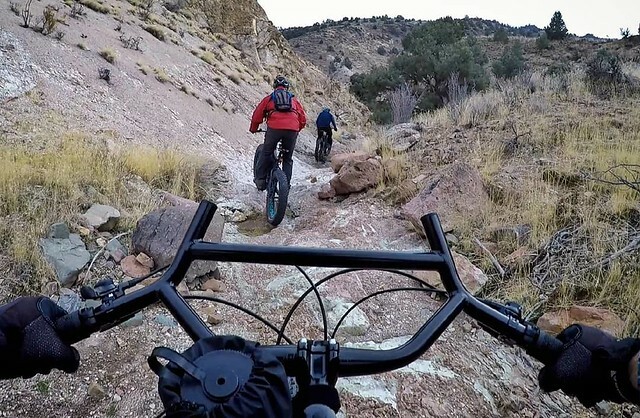 Thankfully the project has stopped there for now, as it would be really difficult to navigate the canyon outside a train if tracks took over the road and new trails were not built. 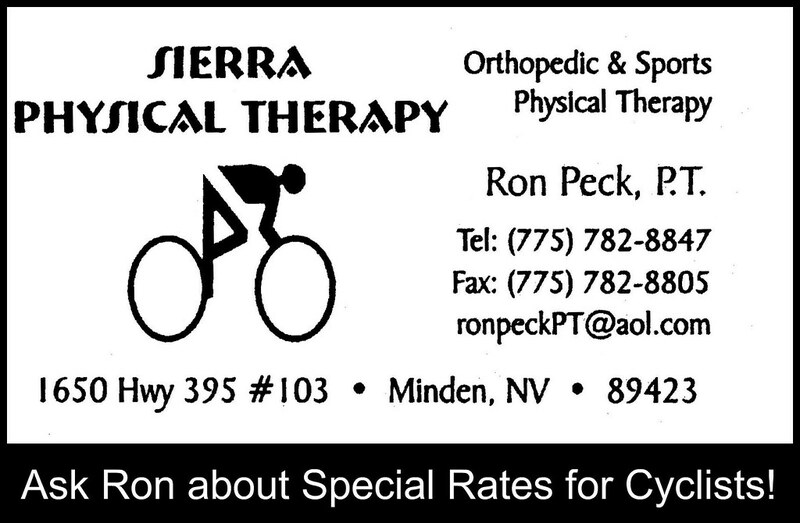 Yerington Smelter site – watch out for broken glass! Following the river down the canyon, you’ll pass many mill sites. 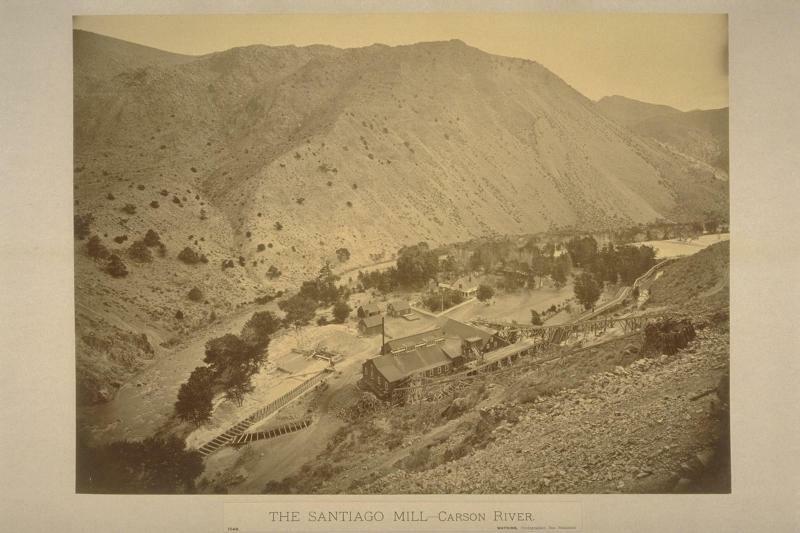 Near the entrance of the canyon, by what is now the BLM office, were the Mexican Mill and Morgan Mill (supplied by water from Mexican Dam). Near the pit mine by the washed out bridge was the Brunswick Mill. East of the Brunswick Mill was the Merrimac Mill. A concrete structure in the side of the hill can still be seen here. 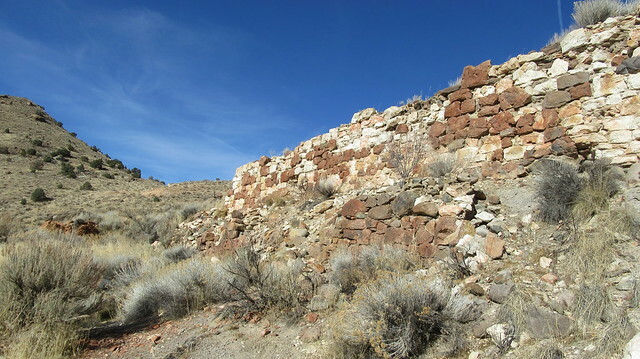 Just around the corner from the Merrimac site is a concrete wall where the Yerington Smelter sat. This was a popular target shooting spot for years, and is still riddled with broken glass and misc. garbage. 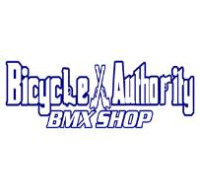 Take care if you ride your bike close to investigate. 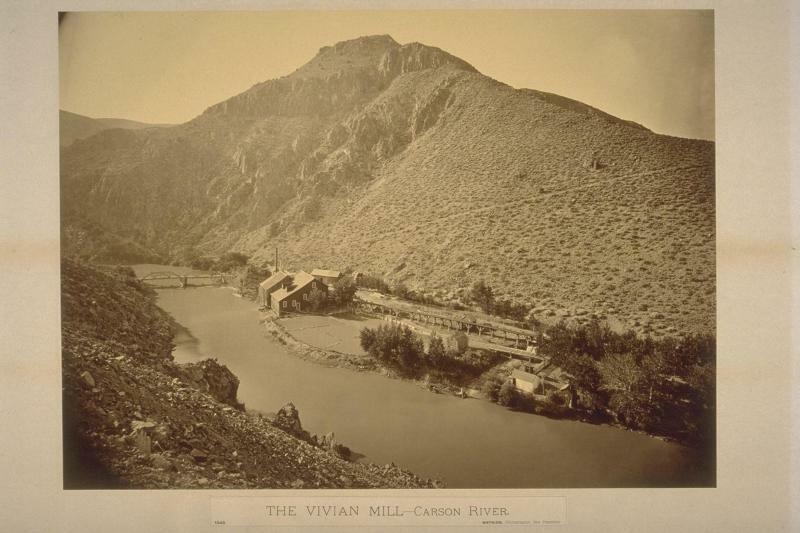 Around the corner from the smelter was the short lived Copper Canyon/Blue Canyon Mill. When the road narrows and becomes really rocky, you are above the Vivian Mill site. 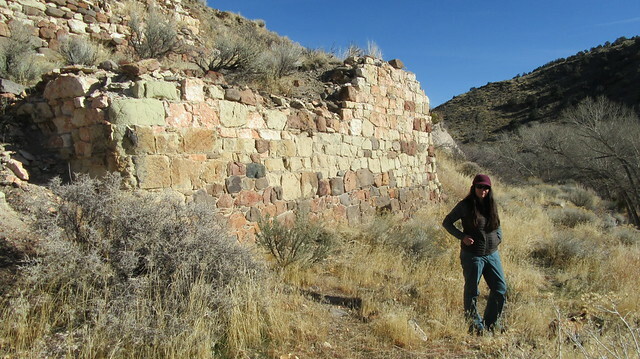 A bridge at the bottom of the hill got people, ore, and supplies to the mill which was on the south side of the river. After leaving the narrow road and continuing east, the Santiago Mill site is visible below. 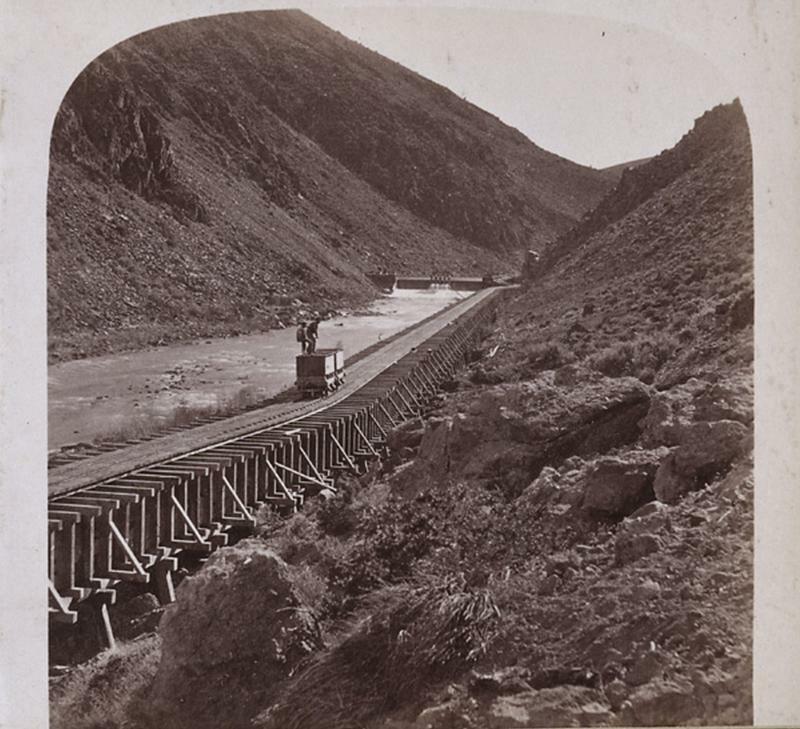 The V&T Railroad left the river canyon where Santiago Canyon meets the Carson River Canyon. To get ore to the Eureka Mill more than a mile downriver, the V&T would drop ore into a chute where it was picked up and transported via a 30″ narrow gauge railroad. I hadn’t explored this section until recently, and it turned out to be a great section to ride on the mountain bike. At the bottom of Santiago Canyon you can still see the stonework where the bridge trestle was for the Eureka Mill Railroad. Santiago Canyon from the bridge trestle up to Mound House is not a bad climb out of the river canyon. The day we did it, there was water flowing down the road and made for a challenging climb. 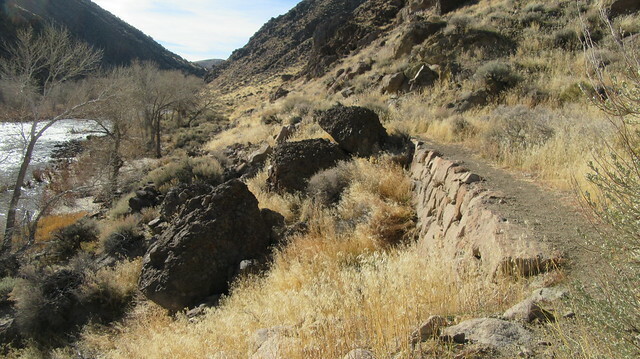 Just past the bridge site, though, you can get on the Eureka Railroad bed and ride further down the canyon. Where the bed ends and drops to the river is approximately where the Eureka Mill Dam was. From there it’s easy to find a singletrack that follows the flume and rail line all the way to the Eureka Mill site. As we first explored the Eureka Canyon flume line, we noticed there are two cuts in the canyon wall. The first historical photos I found showed ore carts on tracks on top of the flume that arrived at the mill via gravity. This made me wonder what the second hillside cut was for. I would later learn that they eventually upgraded the Eureka line with a small steam powered locomotive, and its weight required building a separate track uphill of the flume. Today’s singletrack trail uses both the upper and lower cuts as it makes its way down the river and to the mill site. One of the remnants of the past is not so pleasant. 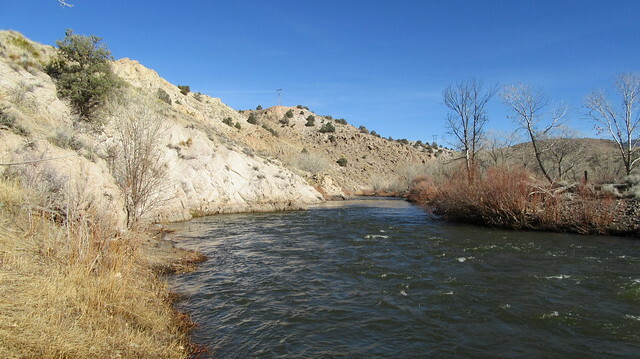 Unfortunately, there is still a lot of mercury left in the Carson River from these 19th century mills. The mercury was used in the milling process to separate the gold and silver from the crushed ore. They were able to reuse some of the mercury in the process, but much of it went into the river as well. The mercury level is still high enough that you’re not supposed to eat any fish out of the river! 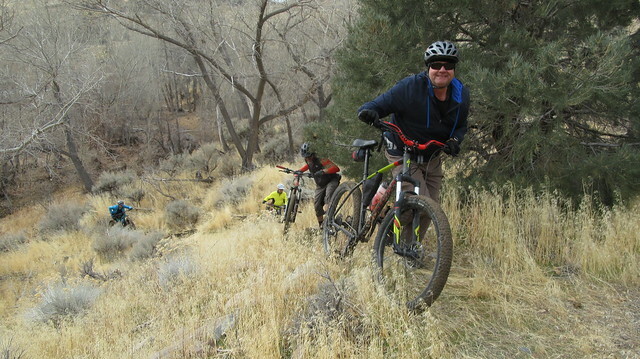 We recently did a loop ride that tours most the Carson River Canyon. 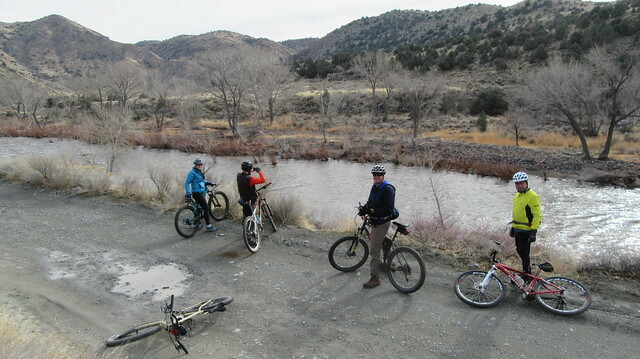 We parked at the river bridge on Deer Run Road, and then rode up to the Centennial Trailhead. 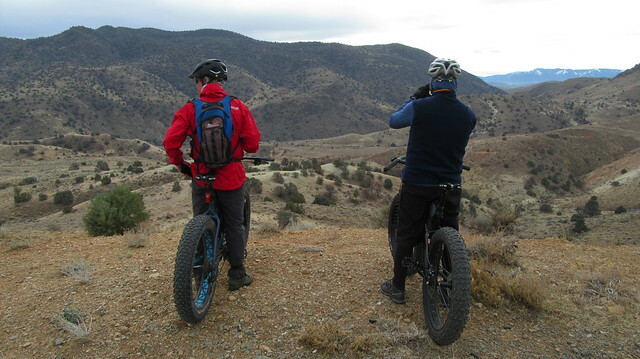 From there we rode the trails to Mound House, and then down into the Carson River Canyon near the Eureka Mill. 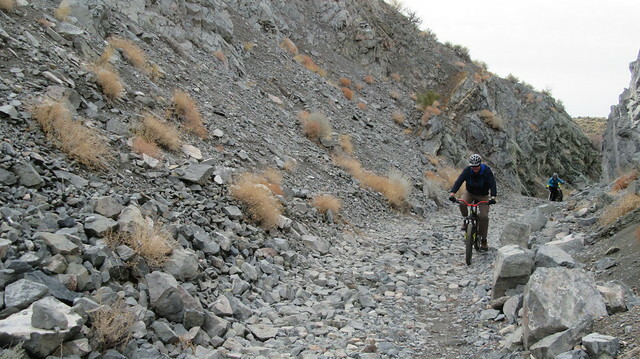 The canyon terrain is really steep in this area, so it took a bit of hike-a-bike to navigate. I will alter my route slightly next time I ride this section, as we encountered a couple dead-ends and had to backtrack. 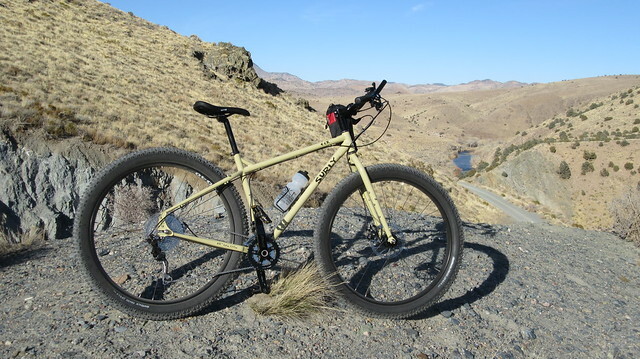 Once at the Eureka Mill, though, it’s great riding all the way back to the Carson River Bridge. 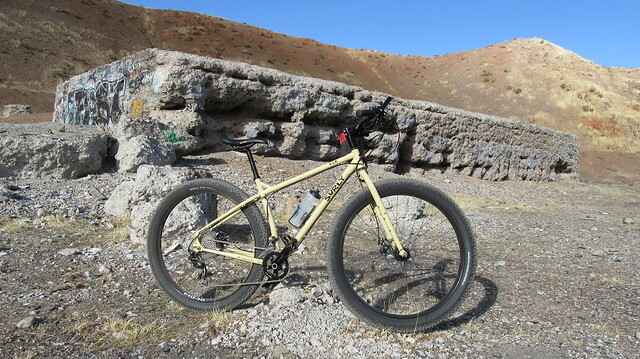 We did some recon near the Santa Maria Ranch in Dayton to see if the whole river canyon could be ridden. 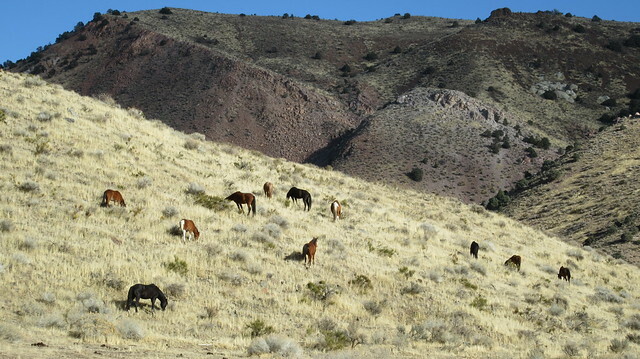 Unfortunately, the whole ranch area is posted as private property with no entrance to the canyon. 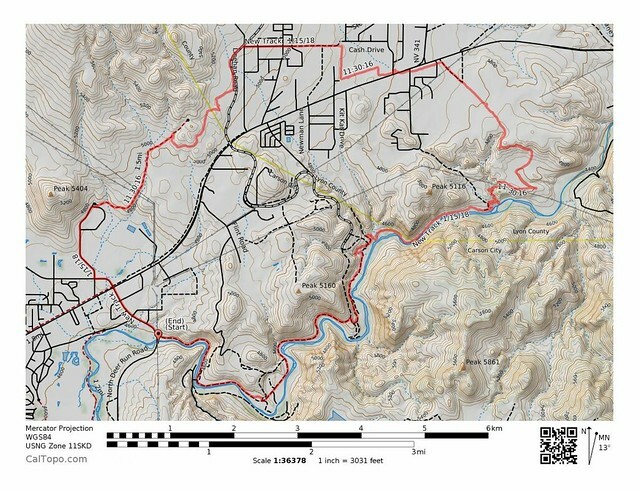 There’s a public access road on the south bank that goes pretty far into the canyon, but there would be a river crossing to get back to the Eureka Mill. The river could only be forded later in the year during a light water year (like this one is shaping up to be). 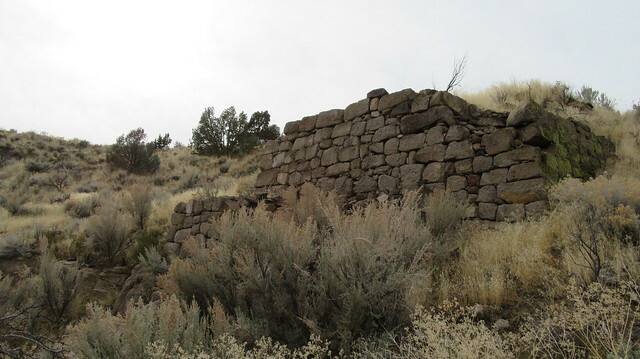 Just up river from the Santa Maria Ranch is the Franklin Mill site. It does look worth exploring, but it’s a drop-in along steep roads to get to this area. It would be a good climb to get back out. More exploring of this section is in order to know for sure. East of the Eureka Mill. You must go up and over to go further downriver. 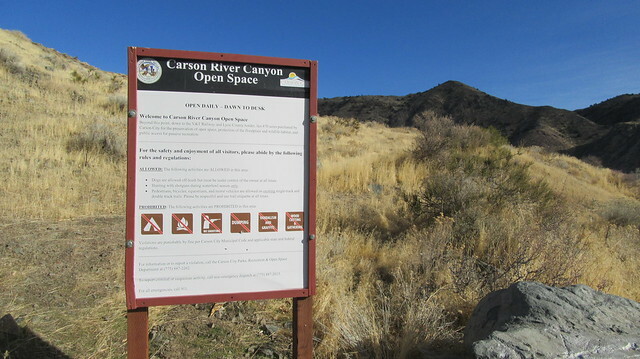 As I mentioned in the beginning, the new Open Space regulations have really made the Carson River Canyon a much more enjoyable place to visit. There was definitely less garbage, and the solitude seemed to be better suited for attracting the wild horses and wildlife. 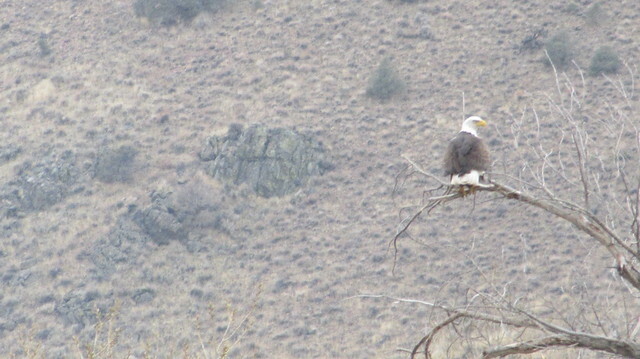 We even saw bald eagles near Santiago Canyon! 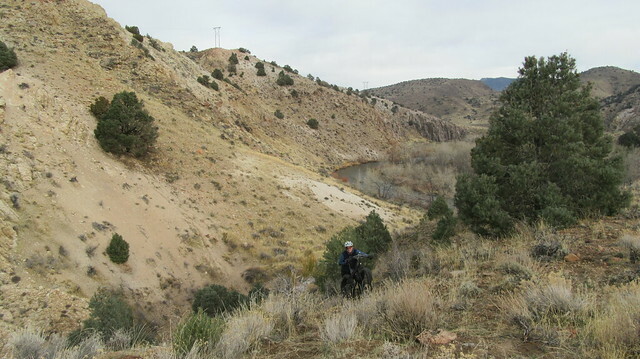 4×4 drivers, ATV riders, hikers, mountain bikers, and hunters were all seen out enjoying the river during out outings. You can still hear the nearby target shooting range over the hill, but it’s pretty subdued and non-threatening. 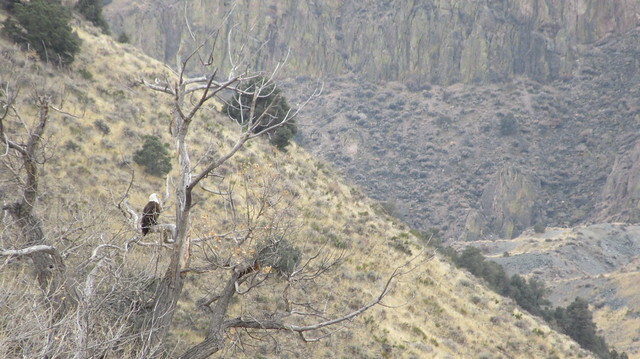 On one ride into the canyon, though, we still encountered some illegal shooting by the Santiago Mill site. It sounded like a fighter jet was roaring through the canyon, and we didn’t dare peek over the edge of the road because we couldn’t tell which direction they were shooting. 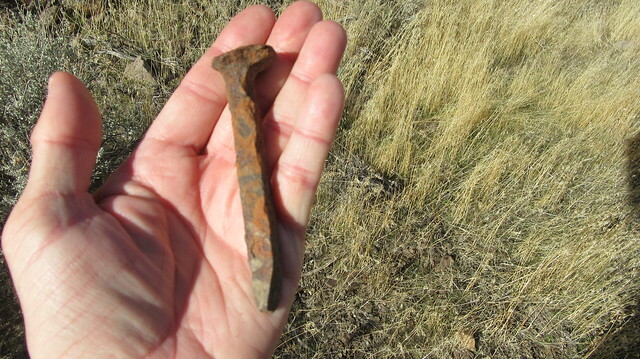 And on another ride closer to Mound House, we had a bullet hit the ground pretty close to us! We had just passed some guys target shooting across the road a ways back, and had to get their attention before passing through. 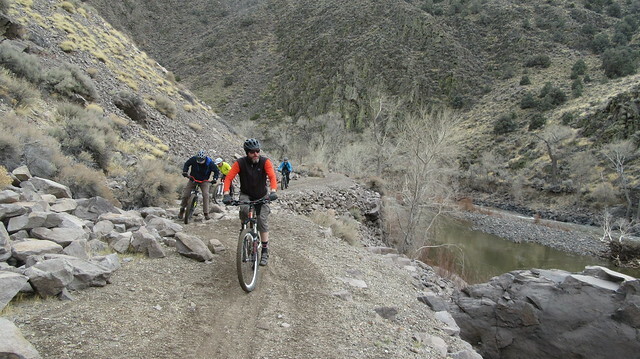 We didn’t stick around to find out if the shot was intentional, and made haste down into the river canyon. So as you can see, there’s still reason for using caution. I would not hesitate to go back, though. It’s a beautiful area, and worth the annoyances. I can only see this area getting better as more people return and rediscover recreation along the river. It’s a place we should all take pride in and preserve. If you’re interested in learning more about the Carson River Mills, I encourage you to read Mills Along the Carson River by local author Daniel Webster. It’s full of great information, photos, and maps. With the Comstock mines getting most of the attention, this book will help make sure the mills are not forgotten. 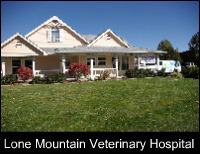 They’re a very important part of the Carson City area history! Jeff, excellent story and photos! 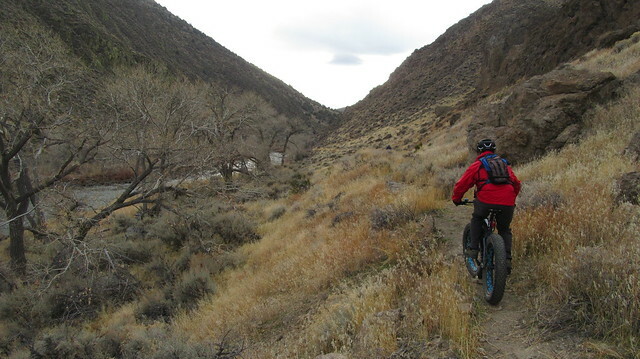 I love riding in east Carson City and look forward to checking out the old mills. Invite me next time! Hopefully you can get CC Open Space to put this article on their website – lots of great research and pictures. This is a dream of many to be able to ride this entire experience in the future on a single track all the way to Dayton.